This is a guest post from Midemblog by Syd Lawrence, who has made so many music hacks and apps that he has his own tag here. So it’s been a busy few months, which means I am sorry; it’s been a while. It also means this is going to be one epic post, on all the best music hacks I have seen over the last couple of months. In that time we have had four Music hackdays, Boston, Reykjavík, London and Scotland and there has been Kings of Code Hack Battle organised by the guys at The Next Web. And that is just organised hackdays, let alone developers just playing around in their free time. So, without further ado, here is a list of my favourite music hacks over the past months. Unless you live under a rock, there is a high chance you would have seen this beauty by none other than Paul Lamere from The Echo Nest. This, my friends, has won the internet of 2012. We can all pack up our bags, and take of home early for Christmas. Using Echo Nest’s remix api, it splits songs down into chunks and then loops and jumps indefinitely throughout the song, creating an infinite track. 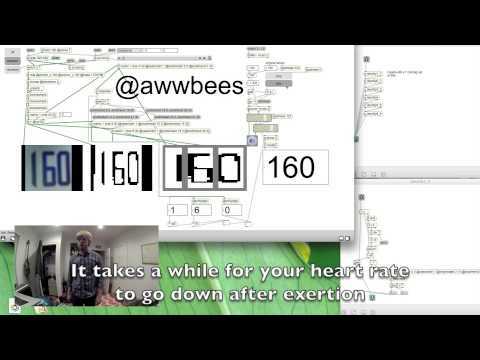 Through the process of putting on a heart beat monitor, patching the data into pure data, and mapping it to the tempo of the track, Heart Beats affects the tempo of a track dependent on the user’s heart beat. It was made by Ryan Chalinor of Harmonix (the company behind Guitar Hero and Dance Central). The above video has 350,000+ views on YouTube, by the way. This takes the classic song “I’ve been everywhere (man)” and obtaining the lyrics from Musixmatch, and the track from toma.hk. The developer was able to perform real time geocoding to drop a tiny Johnny Cash face onto a google map at each location Mr Cash has visited. There is also a simple distance tracker to see how far Mr Cash has travelled. We’ve all had those times where we want to play a Soundcloud link down the phone to a friend, haven’t we? Now you can! Want to create a theremin powered by your face? I thought so. Well, Mint Digital’s Phil Nash created exactly the thing for you. Using the new webcam technology in Google Chrome, you can power a theremin with your face. Want to join a barbershop quartet but can’t sing? Worry no more, Nick Palmer & Dan Horgan created a tool to help in this exact situation. Taking an absolute myriad of technology, Barbertron takes any singing and harmonises it. Works over the phone with Twilio and then uploads the end result to Soundcloud for definitive lols. How’s about a single song that contains every number 1 from the Billboard charts since 1890? 11 minutes of aural entertainment. Incredible. Thanks for featuring our hack Remix of the Century!